The credit crunch has resulted in increased difficulty with regard to borrowing money. Home loans, auto loans and even credit cards have been harder to get over the last couple of years. Things are starting to loosen up a bit, as evidenced by the offers reappearing in my mailbox, but many are still being denied credit. If you have pretty good credit, and you think that your most recent credit application denial is unfair, you can actually challenge it. By law, you are entitled to a free copy of your credit report when you are denied credit. 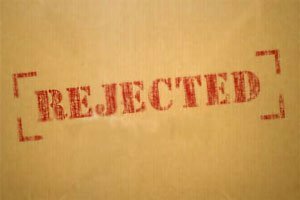 Read your rejection letter and find out which credit bureau was responsible for providing the information to the credit issuer. Make a copy of the rejection letter, and mail it along with a letter to the credit bureau requesting your free copy of you credit report. This letter should include your name, address, Social Security Number, and other information that makes it easy for the credit bureau to identify you. Send the documents via certified mail, requiring a signature (and providing you with a receipt) so you have proof that the letter arrived. You only have 60 days to do this. Note: You can also get a free copy of your credit report from each bureau online. The credit bureau will send your credit report. Look through it for evidence of errors. According to the United States Public Interest Research Group, almost 80% of credit reports contain errors, and 25% of credit reports have a mistake large enough to result in credit application denial. Check through your report, and mark the errors. You will need to ask the reporting company and the credit bureau to fix the issue, and you can use evidence of errors to challenge your current denial of credit. Many credit rejection letters are quite vague, simply telling you that information from a certain source was used to deny your credit. If your credit report is positive, with no errors, and your credit score is decent, you might want to find out more about the rejection. You are entitled more specific information than that, if you wish it. You can write a letter, citing Section 615(b) of the Federal Fair Credit Reporting Act, requesting the specifics of all the information used in the decision to deny your credit application. Ask for information disclosed by those other than credit reporting agencies, and request that the information be sent to your address within 30 days (per FTC definition of a “reasonable period”). You will need to include your name, address, birth date, Social Security Number, current address and possibly the identifying number for your case (if provided). Again, send this request by certified mail, ensuring that the credit issuer receives it. If there are mistakes to be fixed in your credit report, you can request that the updated and corrected version be sent to the issuer who denied you credit, and send a written request to the issuer to review the case again, using the accurate version of your credit report. You will have to request this from the credit bureau, though, since bureaus won’t automatically send updated copies to those who have looked at your report. If other information was used as a factor in denying your credit application, you should round up supporting documentation and make a case to the issuer about your creditworthiness. Challenge the points that resulted in your rejection with explanation and back up support. If the credit denial was made based on faulty information, the credit issuer could reconsider and decide to issue you credit after all. Of course, the issuer may not change its decision. In such cases, at least you know what you need to work on. If it turns out that the issuer rejected your credit application based on legitimate information, such as the length of your credit history, debt to income ratio, current income, credit score or some other factor(s), this can be a good time for you to consider your financial habits. Find out what specific issues prevented your approval for credit, and then beginning working to improve them. This could mean improving your credit score, looking for ways to increase your income, or paying down some of your other debt.